When purchasing a used car safety and reliability matter most. That’s why buying a Honda Certified Used Car is a smart choice. 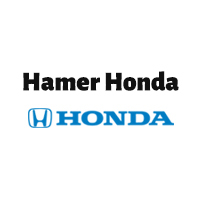 Only well-maintained Hondas that pass the outstanding 150-point inspection are certified. With program benefits like a free CARFAX Report, and a 7 year/100,000mile warranty, you will have peace at mind that you made the right choice. A free CARFAX® vehicle history report is Provided with every Honda Certified Used Car. In addition, CARFAX will buy back any vehicle that turns out to have a severe problem reported by a state Department of Motor Vehicles that is not included on its Vehicle History Report. It’s a guarantee that makes buying a used car virtually as risk-free as buying a new car. Not only are Honda Certified Used Cars known for their award-winning reliability, durability, and exceptional brand quality, they are also covered by one of the most extensive used-car limited warranties in the business. And to make this warranty even better, you pay no deductible! Major engine and transmission components, except for standard maintenance items, body glass and interior. The repair or replacement of any covered part that is defective in material or workmanship under normal use. With a $0 deductible. Powertrain coverage for 12 months/12,000 miles (whichever comes first) from the vehicle’s original in-service date. 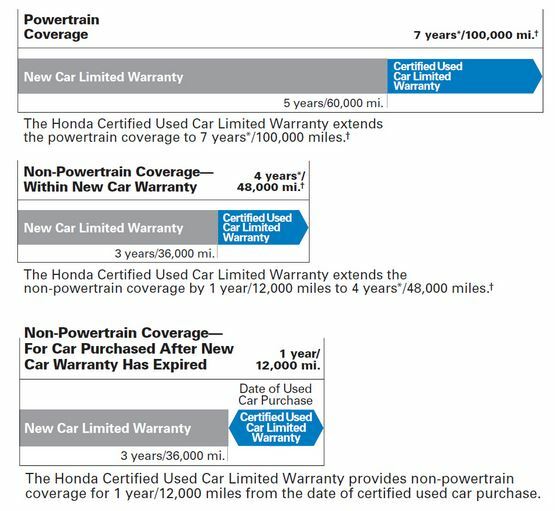 Non-powertrain coverage for 12 months/12,000 miles (whichever comes first) from the original warranty expiration date, or if the original warranty has expired, from the Honda Certified Used Cars purchase date. SiriusXM* Radio is an extraordinary way to experience a huge variety of digital entertainment. Now, customers who purchase any Honda Certified Pre-Owned Vehicle factory-equipped with SiriusXM Radio will receive a free three-month trial period. Please ask your dealer if your vehicle has factory-equipped XM. Honda Certified Used Cars qualify for Honda Care® Certified Additional Coverage, with plans ranging from 7 years/100,000 miles up to 8 years/120,000 miles from the original in-service date. SiriusXM services require a subscription after any trial period. If you decide to continue your SiriusXM service at the end of your trial subscription, the plan you choose will automatically renew and bill at then-current rates until you call SiriusXM at 1-866-635-2349 to cancel. See our Customer Agreement for complete terms at www.siriusxm.com. Fees and programming subject to change. XM satellite service is available only to those at least 18 years and older in the 48 contiguous United States and D.C. ©2017 SiriusXM Radio Inc. Sirius, XM and all related marks and logos are trademarks of SiriusXM Radio Inc.